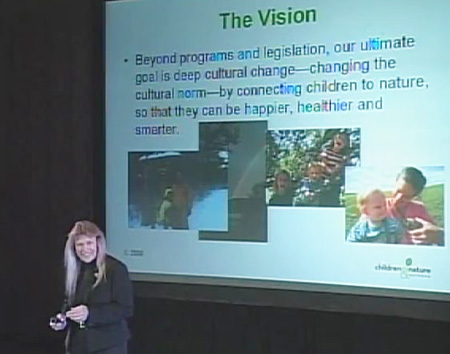 A frequent keynote speaker, Cheryl speaks about the growing disconnect between children and nature, the indicators of what Richard Louv calls “nature-deficit disorder,” and the scientific as well as common-sense evidence of the benefits to children from direct experience with nature on a daily basis in their lives. In addition to re-connecting children and nature, she addresses the importance of civic and community health and ways to foster collaborative community-building efforts. For speaking engagements, please contact Jackie Green, Jacqueline Green Public Relations Inc. In Los Angeles.